The event is the most important event for the industry in Latin America. And it’s the ideal environment for strengthening the industry’s networking, disseminating knowledge and new technologies, and generating business with the potential to make cities smarter and more sustainable. The event is divided along two fronts: the Congress and the Exhibition. The congress will address 03 thematic axes, focusing on regulation, batteries, and innovations. The congress will include renowned national and international speakers. The Trade Show: Much more than just a trade show. This is where all the solutions for urban mobility, infrastructure, and policies for non-combustion vehicles will be presented. With 40,000 sqm of built area and fully equipped with a HVAC system, Transamerica Expo Center has an infrastructure to host various types of events. It has 7 independent halls – integrated and on the same floor – as well as 15 meeting rooms located on the mezzanine. 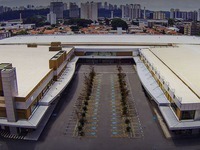 Transamerica Expo Center is located in the neighborhood of Santo Amaro, Southern São Paulo. The venue is one of the largest in São Paulo, and is home to several large trade shows and conferences that take place in the city. There is only one option of accomodation within walking distance from Transamerica Expo Center, but the area lacks restaurant and shoppings options. We recommend you not to stay at any hotel South from the venue, so the best options would be in Chácara Santo Antônio, Vila Cordeiro and Brooklin neighborhoods, as they are all relatively close to Transamérica. Morumbi has good options of accommodations in case you wish to stay in a more residential neighborhood.